Traveling for work the entire month of October, I was beginning to miss my kitchen and home cooked meals. 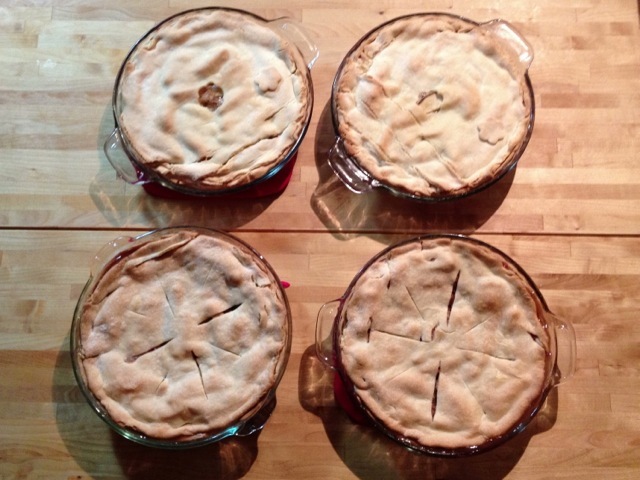 In an almost binge-like fashion, I jumped back into cooking by making six pies in less than a week. Not wanting to get too adventurous at first, I decided to bake a simple apple pie to take to the office and a pie to eat at home. The pie was so well received that I decided to not only make another apple pie but to also make a ginger pear variation of the pie for the office Thanksgiving lunch. While I was making pies for my office, I went ahead and made pies for Jill’s class too. Just in time for Thanksgiving, here is the recipe I adapted from my mom to make a delicious apple pie. 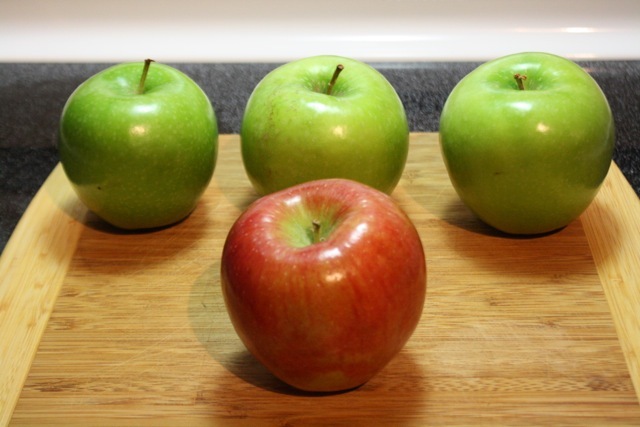 The combination of the Granny Smith Apples, which are known for their tartness, and the Braeburn apple, which is a slightly sweeter relative of the Granny Smith apple, provides a nice balance for a pie that is neither mouth-puckering tart nor tooth-achingly sweet. Preheat an over to 450 degrees. 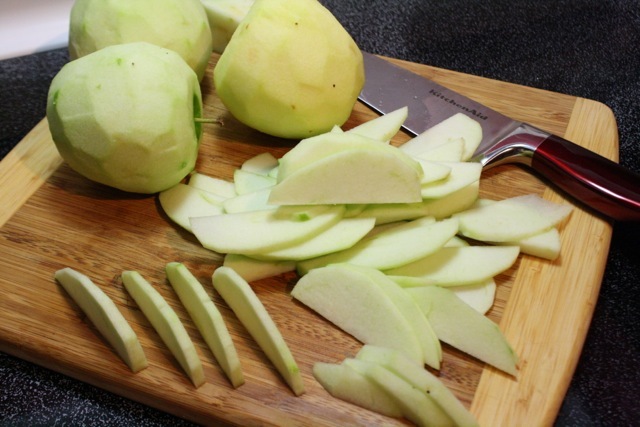 Peel, core, and slice the apples into about 1/8 inch slices. 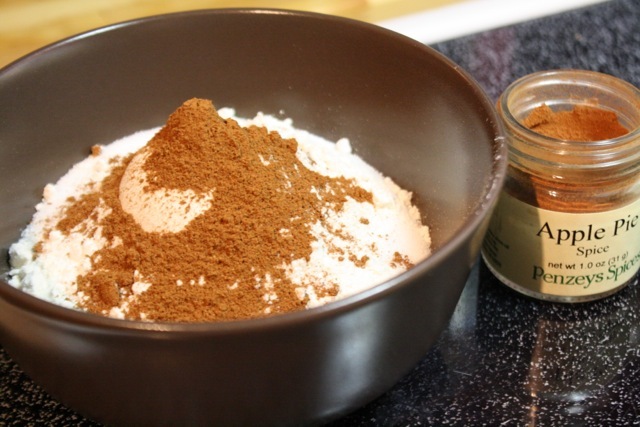 In a bowl, mix together the sugar, salt, spice, and flour. I used Penzey’s Apple Pie Spice, but plain cinnamon would be fine. Place one of the roll-out crusts in a pie plate. 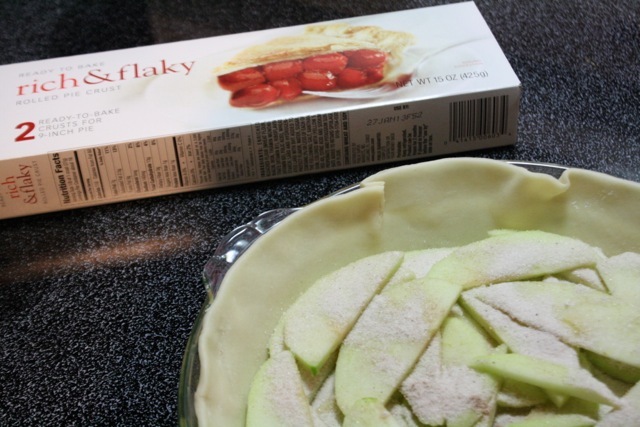 Cover the bottom of the pie crust with a layer of sliced apples. Sprinkle the apples with the sugar mixture. Continue adding layers of apples, sprinkling each layer with the sugar mixture. It may seem like a lot of sugar, flour, salt, and spice for the pie, but use all of the mixture. The juices that cook out of the apples will mix with the sugar and flour to make a cohesive apple filling. 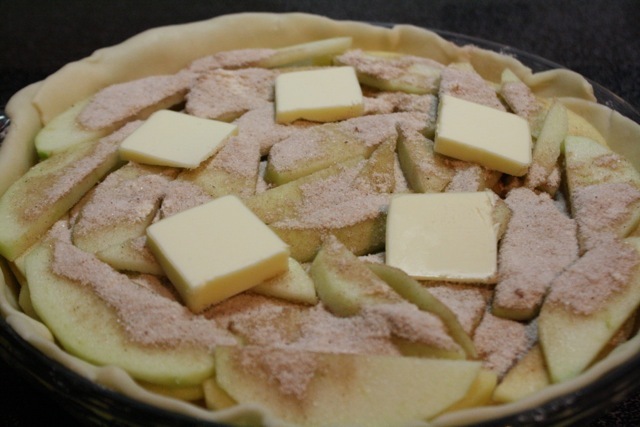 Once the crust is full of apples, top the pie mixture with pats of butter. Place another roll-out pie crust on top of the pie, fold the top layer under the edges of the bottom layer, and crimp to seal the crusts together. Use a sharp knife to cut a few slits in the top pie crust. Bake the pie at 450 degrees for 10 minutes. Then, lower the temperature to 375 degrees and bake the pie for 30 more minutes or until the pie crust is a light golden brown. 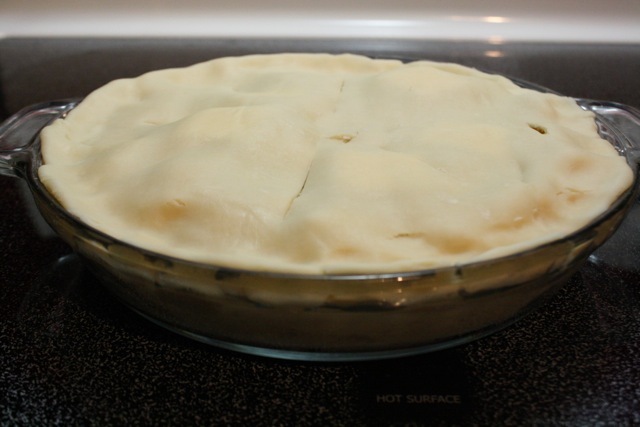 Let the pie cool slightly before serving, otherwise the filling may be too liquid. 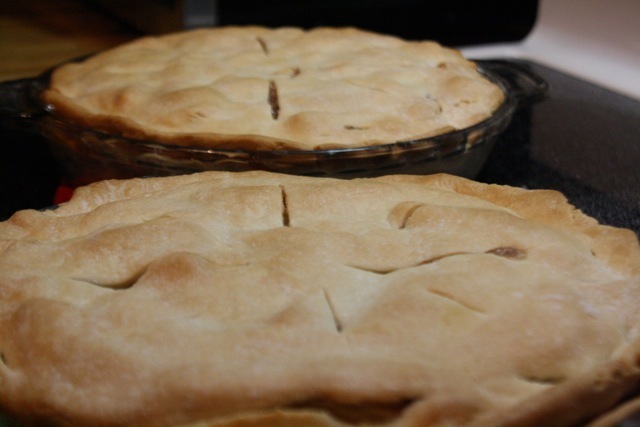 This apple pie recipe is relatively simple. You could make your own pie crust, but using the refrigerated roll-out crust saves time that you can spend making other Thanksgiving Day dishes. The mixture of Granny Smith and Braeburn apples provides a tartness that keeps the pie from being too sweet after the sugar mixture is added. This recipe also lends itself to more adventurous variations. 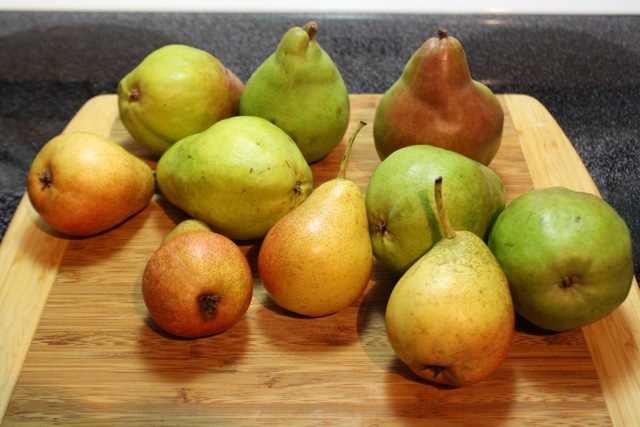 For examples, I replaced with apples with Forelle, Comine, and Bartlett Pears (I did not peel the pears) and replaced the cinnamon with ground ginger and kept everything else in the recipe the same to make a Ginger Pear Pie. The ground ginger really comes through in the pie and complements the sweetness of the pears well. If you are invited over to share Thanksgiving with family or friends this year, volunteer to bring dessert. Don’t pick up a pre-made pie from the grocery store, use this recipe to make an apple pie, a ginger pear pie, or both. You will probably get invited back for Thanksgiving dinner next year. Yumm!!! Both the apple and pear had the perfect balance of sweet and spices.